Here is my attempt at doing this question. I have to say, if a question on voices came up, I think a lot of students would avoid it, as the text-books have very little to say on this topic. It is tempting to just fall into a generic template for or against religious experience, but the topic of voices has some issues specific to it. For instance, and I didn’t say this in the essay, voices are usually linked to prophetic apparitions such as those of Fatima. The prophetic element is obviously explained by the need to convey a message. One of the strangest examples of voices is that of Pope Leo XIII on October 13 1884, 33 years to the day before the Fatima visions, hearing two voices – one kind and gentle, the other guttural and harsh, conversing. The conversation was supposedly between Christ and the devil, over how much time would be given to the devil for him to do his work in bringing down humanity. Voices or locutions (from the latin locutio – speech) are a common aspect of certain types of religious experience, and are seen by the Catholic Church as a supernatural communication to the ear, imagination or directly to the intellect. They are supernatural in that the locution is meant to have its origin in a spiritual realm either heavenly or demonic. In most examples of this type of experience the voice is only heard by one person or a few individuals. Occasionally though, the locution does come from sound waves travelling to the ear, and thus has an external source Often, voices are accompanied by visions, but not always. A clear example of this is the revelations of the Virgin Mary to the three children Lucia, Jacinta and Francisco at Fatima in Portugal in 1917. The children saw a lady who showed them visions, for instance of hell, and they were also instructed by her as to the meaning of the visions. However, only Lucia and Jacinta heard and saw all that was revealed, whilst Francisco just saw the visions but did not hear the speech. However, according to Teresa of Avila, voices should be tested to see if they have a natural or supernatural source. If natural they should be rejected as the result of an overactive imagination. If they are supernatural it is still to be discerned whether they are from God or the Devil. The only way this can be decided is in the effect it has on the person. 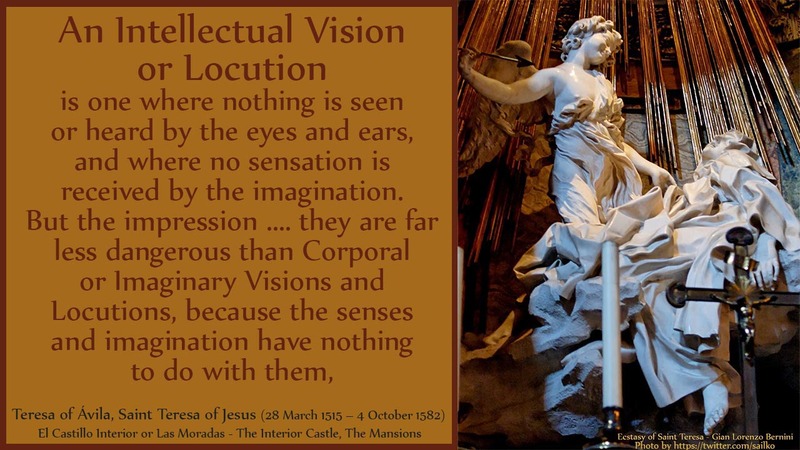 St Teresa describes some of the effects of true locutions: they have a sense of certainty, power and authority, they bring calm and tranquility, and they are remembered for a long time. On the contrary, voices from the devil produce agitation or over-excitement in the recipient and make him fall prey to pride and other sins. The issue that is often raised in connection to voices is the possibility of a non-supernatural origin, indeed skeptics would say that there is always a psychological explanation for this kind of religious experience. This is particularly the case with voices as they are very commonly reported by people suffering from certain kinds of mental illness such as schizophrenia or other psychotic episodes. The most common psychiatric explanation for psychosis is that part of the conscious mind of the person becomes overwhelmed by unconscious contents and seems to take on its own significance over and against the conscious ego-centre of the individual, such that they feel powerless to control it, and experience the psychosis in the form of voices or hallucinations which are usually unpleasant and which interfere with the autonomy of the mentally ill person. In The Varieties of Religious Experience, William James gives a psychological explanation for voices which seems at least sympathetic to this view. Firstly, he outlines the passivity of someone undergoing a religious experience, so that it seems to come from the ‘other’ and the receiver can do nothing about it. This would seem to echo the psychologist’s understanding of what happens in psychosis. Secondly, in James’ discussion of what he calls the ‘sick soul’, he explicitly draws parallels between a certain religious type, and certain kinds of mental illness in which voices occur. For instance, he describes the melancholy temperament of John Bunyan, who was ‘sensitive of conscience, beset by doubts, fears and insistent ideas, and a victim of verbal automatisms…these were usually texts of scripture, which…would come as if they were voices and fasten on his mind…’. James goes on to link the crisis that often comes to the sick soul type, and how they can become ‘twice-born’ ie. flooded with a newfound conviction in God, after much despair, and he says that these conversions are often linked to voices and visions. He relates how many religious founders or important figures such as George Fox or John Wesley heard voices because they were of ‘exalted sensibility’. He leaves open the question of whether these ‘incursions from beyond’ have their origin in the unconscious mind, or whether they have an ultimately supernatural origin. Sigmund Freud, the father of psychoanalysis, had a purely reductionist view of religious experiences, and locutions would have been for him a psychotic or neurotic manifestation of unresolved trauma from childhood. Freud felt that Religious experience is explicable in terms of psychological factors acting on the personality, factors that are ultimately based on childhood traumatic experiences involving the parents. For Freud the human condition is one of fear in the face of our mortality, and helplessness in the face of nature. Thus we need comfort – as children this comes from the father, later in religion the father-in-the-sky. This religious comfort is wish-fulfilment – Freud believed that powerful wishes could find outlets in dreams, but also in other delusory states – essentially then religious visions, voices and experiences are hallucinations which come from our powerful need to feel control over our own helpless state. With this interpretation, it must be remembered, Freud did not mean to dismiss religious experience as untrue, he said that just because religious experiences are illusions, it doesn’t mean they are false, an illusion like this is not an error, as it is based on one of the oldest, strongest wishes of humankind. Presumably he meant by this that there is a certain meaningfulness or significance to religious experience because they come from such a deep-rooted and universal source, but it is hard to see how I can retain my belief in the veridicality of my experience whilst also seeing it as a wish-fulfilment. If it is caused by my desire for security and meaning in my life its source can’t be in the divine or supernatural realm. It seems to me that St. Teresa could very easily be updated for modern times to critique Freud. What she called voices from the devil, could be seen to be the voices that mentally ill people hear, as their effect is usually disconcerting and negative. Whereas if we apply her and James’ criteria of positive emotional and behavioural impact on the believer we have a way of easily distinguishing ‘real’ voices from false ones. Freud’s disciple Jung claims that the divine reality cannot be a ‘nothing-but’ – voices have important psychological benefits which can lead to the integration of the personality – a wholeness that the conscious mind usually resists at its peril. Equally, Swinburne argues we cannot just dismiss voices and other religious experiences with an automatic skepticism, indeed, his principles of credulity and testimony turn the tables on the skeptic and challenge him to take voices seriously. In conclusion, it cannot be stated that voices are evidence of psychological neurosis, as this is a blanket statement, assuming a reductive materialism which ignores the epistemological problems with all experience, and which doesn’t do justice to the ‘fruits’ of the experience of the voices in the life of the believer. Clearly, there are many cases of voices being heard in neurotic episodes, but as stated above, and as James attests, unlike voices in religious experiences these do not lead to an integrated, stable, compassionate and insightful individual, capable of ministering to others and organising practical matters such as St. Teresa or John of the Cross (who both founded and led religious orders), but rather to individuals who sadly are unable to function well in society. However, just because voices are not always evidence of psychological neurosis, by no means proves that they are from God – and it may be that there is some depth psychological explanation which is the best explanation for them. Both Jung and James thought that if there was a divine reality on the other side of the experiences of the mind, then it can only be known through that experience, and both remained essentially agnostic (with some qualification) on the matter.